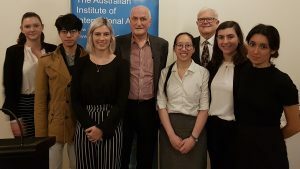 On Tuesday 16 October, the current AIIA NSW interns addressed the Institute on topics of their choice. How much damage is being done through constructing dams on the Mekong? With its vigorous activities in the Upper Mekong and influence on other riparian states, China virtually dictates dam construction policy. Benefits from electricity generation are increasingly outweighed by environmental damage. Upstream dams disrupt the monsoonal flow – the natural flood ‘pulse’. This in turn increases saline levels and interrupts the alluvial flow downstream, essential for wetland agriculture and for fish stocks in the delta. Climate change is a further complication. Regional meetings have not so far created a modus operandi that satisfies all concerns, or placed effective pressure on China to modify its dam construction program or dealt with the consequences of Vietnam’s hydroelectric generation. The riparian states – Thailand, Cambodia, Laos and Vietnam – must put up with the consequences. As the regional hegemon, China continues to call the shots. China increasingly uses control of its media to promote Chinese values inside and outside China. Chinese youth are influenced by the Chinese media’s promotion of socialist values, especially given their lack of access to the Western press. Chinese media, including films, are increasingly available throughout Asia and Africa. Although many Chinese media products are too strident to be very effective abroad, its cinema, especially patriotic films, are popular at home even if, in the short term, the more sophisticated Western movies will maintain their edge. China’s media are an important soft power tool. The growing role of China in the global media landscape is enhancing the government’s hold on domestic opinion and contesting Western hegemony in the region and the wider world. DFAT has a predominantly negative culture about China. It is driven by unquestioning fealty to the United States alliance, and it is subject to little debate. Originally based on United Nations principles, the frequently cited ‘rules-based order’ is now seen as formulated and underwritten by the United States. The United States sometimes transgresses the rules it urges on other countries. But the culture within DFAT, as revealed by interviews with a wide range of former DAT officials, is one of unquestioned allegiance to Washington, driven as much as anything by a growing concern about China, which is seen as antagonistic to the existing order. This mind-set inhibits an open and pragmatic approach towards constructive engagement with China. It helps explain why DFAT officials are collectively reticent about whole-hearted engagement in China’s belt and roads initiative. DFAT officials remain cautious, and their attitude is sceptical and security-based. Thanh Nguyen: Is there a case for an independent Taiwan? The history of the island country is well known, beginning with the evacuation of the Chinese nationalists under Chiang Kai-shek from the mainland in 1949 following their defeat at the hands of the Chinese Communists under Mao Tse-tung. At first, Chiang and his successors refused to accept reality, and were bent on returning to the mainland. This ambition gradually gave way to a realization that defeating the Communists was unrealistic. From 2008 there has been a period of nation-building, and the fusion of Sinicisation with the culture of Taiwan. The current president, Tsai Ing-wen, now openly characterises Taiwan as an independent democracy of 23 million people with its own national agenda, much to the irritation and annoyance of Beijing. The general policy is one of economics first, politics later. Whether Xi Jinping will hasten his agenda to re-take Taiwan, or tolerate its growing independence, remains an open question. By itself, the Shia-Sunni divide is not the most significant factor dividing Middle Eastern nations. More important is the rivalry between Saudi Arabia and Iran as they compete to be the dominant power in the region. The religious divide reinforces this rivalry. Saudi Arabia, backed by the United States and Israel, represents the Sunni regional majority. The Shia are a minority, heavily supported by Iran, Lebanon and Bahrain. Iraq, Syria and Yemen are all victims to proxy wars waged and supported by Saudi Arabia and Iran. The prevailing concern of the Saudi establishment is that Iran will successfully spread its revolutionary views, which openly question the legitimacy of the Saudi royal family in Islamic doctrine, throughout the region. The Saudis have said they will go nuclear if Iran does. President Trump’s withdrawal from the JCPOA increases the likelihood that Iran will forsake the Plan and pursue the uninhibited development of nuclear weapons. But Saudi Arabia may decide to get ahead of Iran and develop its own weapons first. If that happens, can Egypt and Turkey be far behind? It is all a disaster waiting to happen. The 1978 Treaty of Peace and Friendship between China and Japan prioritised mutual economic interests. But because of long-standing historical antagonisms this has not translated into closer relations between the two countries. Indeed the 20th anniversary of the Treaty in 1998 saw the inflammation of relations. Nor, despite occasional visits by leaders, do things look like improving, including when President Xi meets Prime Minister Abe in Tokyo on the occasion of the 40th anniversary of the Treaty next week. The Chinese continue to see Japan as unrepentant about its war-time atrocities in China. They see visits to Yasukuni Shrine by Japanese leaders as reinforcing a lack of sensitivity towards Chinese feelings. The Japanese see Chinese claims to the Senkakyu-Diaoyo Islands as unfounded and aggressive. The Japanese establishment believes that China has not done enough to curb North Korea’s nuclear program, and resents Japan’s exclusion from talks with Pyongyang. There are political benefits for both sides in the maintenance of bad feelings, but there are also risks of escalation through unanticipated armed clashes at sea or in the air. A fundamental shift in attitude is required on both sides.